You must enter values into all 3 form fields to compute result. The capacitor voltage divider calculator calculates the output voltage of the voltage divider network based on the value of capacitor, C1, capacitor, C2, and the input voltage, VIN. 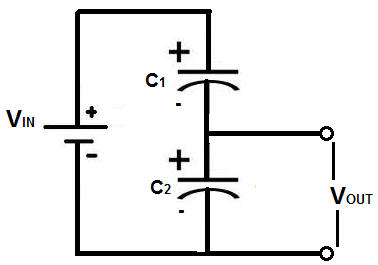 This output voltage, which is the voltage that is dropped across capacitor, C2, is calculated by the formula, VOUT= VIN (C1/(C1 + C2)). According to this formula, the capacitor with the lower capacitance value will drop more voltage across it; and, conversely, the capacitor with the greater capacitance value will drop less voltage across it. To use this voltage divider calculator, a user must enter the value of the input voltage, VIN, the value of capacitor C1, and the value of capacitor, C2, and click the 'Calculate' button. The voltage output result will then be calculated and automatically displayed. The result of this output voltage is calculated in unit volts (V).